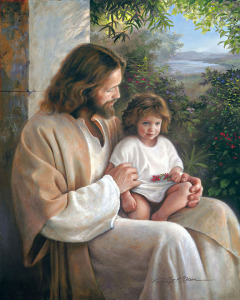 Years ago I used our daughter Kylie as a model for the child sitting on Christ’s lap in this painting. When the painting was finished I hung it in her bedroom near a night light thinking that it might be a comforting image for her to fall asleep with as she went to bed each night. When our youngest daughter Brooke was born she and Kylie shared that same bedroom. One day, when Brooke was about 3 years old, she was in her bedroom with my wife Sydnie. As part of their little conversation Sydnie looked at Brooke and asked, “Brooke, do you know that Jesus loves you?” Brooke was quiet for a moment and then pointed at the painting on the wall and said, “No…Kylie!” Apparently for Kylie the painting had been a wonderful reminder that Jesus loved her, but for Brooke it meant Jesus loves Kylie best. How sad! When I heard this I felt so bad, I thought to myself, “I’ve scarred this poor little daughter of mine!” I had to change Brooke’s perception. Sometimes I think it would helpful if all of us had our own version of a painting like this just as a reminder that “Jesus LOVES ME!” His love is real and transforming, and above all abiding. you have a Picture of Jesus pulling a child out of the water. every time I see that picture I think to myself that it is Jesus pulling my granddaughter out of the Hulbolt River in Nevada where she had Drowned. I feel much better and understand that is where she is at and I find myself not crying that she is gone. she had just turned 6. She has been with Jesus for 2 1/2 years now and I still think that she is in a better place But I do miss her a lot… I love that picture a lot .. I share every one of your pictures so that my grandmothers fosters girls read them and they all love it when I post them and they have to me so I am telling you Keep up the good work it is working on them and Myself… Thank you..
That’s what I always tell my children and grandchildren when I write or text them! Always and Forever! I trust my now and forever to Jesus. I have loved this painting from the first time I saw it. After I married my husband, I have always thought that the girl in the picture looked like my stepdaughter, Kayla. I have often wondered if you had used your children as the models for the children in you paintings. Also, when I look at your “In His Light” painting, I see my son there with the Savior. I love you work. It always gives me such a feeling of peace. I have to confess. After I bought a copy of the picture, I Photoshopped my 2 granddaughters into it as well. They loved it! Your work touches my heart. You show the power of Jesus’ Love. Little children are a GIFT. From God. They are our hope and future. When we show them kindness, it is the same as showing it to the world and to Jesus himself. Then they grow up and pass it along. Beautiful paintings and messages of love ! Oh my! I have a daughter named Kylie as well and I always loved this picture because the child looked like my Kylie. I have kept a copy of a cover you did for Catholic Digest, Dec. 2010. Just today I was cleaning my desk, came across the cover and looked you up. Your art is beautiful. Thank you for sharing your talent with the world. In the year of 1996 I was born. As I was born nobody noticed that something was very wrong with me until my mother looked at how I was breathing That day she found out her new baby girl has five holes in her tiny heart. The year before she lost a set of twins. I died and they brought me back but I was in icu for two weeks. As I was staying there my mother went down to the gift shop and saw your beautiful artwork and knew right then and there her precious little girl was going to be okay. I got a blessing then later four of my holes were gone. I still live with a tiny hole to this day. But every since I have learned about this, this picture has been a sign from god and now it guides in my life. It reminds me of my mother and my struggles. But most of all it shoes me I can go through anything.